KIRSCHEN - German made. 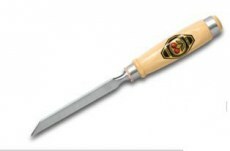 Hornbeam handled bench mortice chisel with shock washer and polished blade. KIRSCHEN - German made. Taper ground and available in 13 sizes 3 to 16mm. Fitted with striker pad - (NOT SHOWN in picture).